FULL OF ANTIOXIDANTS. Matcha powdered green tea has 137 times more antioxidants than regularly brewed green tea. WEIGHT LOSS SUPPORT, Boosts metabolism and burns calories. Already nearly calorie free, matcha is a great addition to a weight loss program by tackling the problem from both sides. It boosts metabolism and burns fat. At the same time, matcha does not put any stress on the body. It doesn't raise blood pressure or heart rate, making it a safe alternative to questionable quick fixes or pharmaceuticals ridden with side effects. ENHANCES MOOD AND AIDS IN CONCENTRATION. Matcha Green Tea may help memory and learning and ability all the while inhibiting any possible side-effects from caffeine, a natural component of green tea. Therefore, a bowl of matcha promotes concentration and clarity of mind without any of the nervous energy found in coffee. 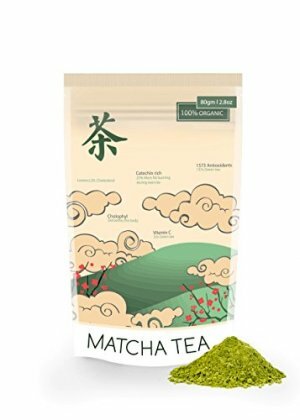 FRESH STANDARD GRADE: This Matcha is of standard grade with a very fresh fragrance of goodness and has all the qualities of ceremonial matcha.